The first priority is to water your tree – attention to watering is essential for the first two growing seasons. 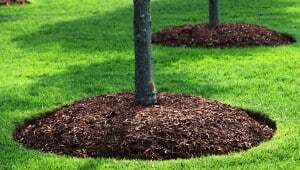 Trees should be watered in well after planting to settle the soil round the roots. After this, continue with the soakings! Your tree must be watered regularly. In hot, windy weather a large tree can use gallons of water per day. Therefore, the whole rooting area should be soaked a minimum of once per fortnight during the growing season, but may need watering as much as every other day on dry land in hot weather. Although you may think that rainfall absolves you of the need to water your tree, a typical summer shower of rain actually does little to restore soil moisture levels. Test this by scraping the top few inches of soil away with a trowel in a small area, which will show you the state of the ground. As a rule of thumb, 25 litres of water are required to soak a square metre of soil to sufficient depth – this typically means 3 minutes with a hose, or five buckets of water, for each square metre of coverage. When watering of course it IS possible to Overwater as well as Underwater. Compare humans, who must have water to live, but who can also drown. Plant roots need water but also air: there must be air in the porous spaces in the soil to allow the roots to breathe, and if there is none, then the roots will drown. So… if your soil is heavy or clayey, be sure to let excess water drain away before watering again. This is the reason that it is so important to ensure adequate drainage when preparing to plant. (TIP: the symptoms of overwatering are easy to mistake for the symptoms of under watering: wilting, dullness, eventual leaf-drop. This can lead to the problem being exacerbated, as a tree looking poorly through overwatering may be given more water in the belief that the tree is dry. If you are uncertain about whether you are overwatering, please contact us for advice. As well as establishing a good watering regime, you will need to attend to weeds. They should be kept down up to half a metre from the stem. You can do this by hoeing, but a mulch of organic matter, such as composted bark, will help suppress weeds while also keeping the roots cool. Stakes and ties should be checked regularly for chafing or other damage to the bark. After two growing seasons they will become redundant and should be removed. Very large trees in exposed areas may need guying, but this is a job for a professional so do seek further advice in this situation. Are there rabbits in your area? If so, you will need to defend the bark of your tree against unwanted nibbles. This PDF article from the Forestry Commission provides information about fencing or guards to protect your tree. Finally, a light application of a general fertiliser may be beneficial early in the year, but don’t overdo it! If you follow all of the above advice, your tree should establish itself well and be a wonderful feature of your landscape for many years to come.